FILE - Indian Navy personnel board the newly built INS Kochi, a guided missile destroyer, during a media tour at the naval dockyard in Mumbai, Sept. 28, 2015. 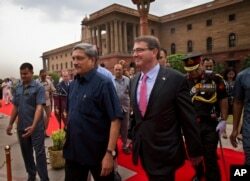 FILE - U.S. Defense Secretary Ashton Carter, right, walks with Indian Defense Minister Manohar Parrikar after receiving a ceremonial welcome in New Delhi, India, June 3, 2015. “The biggest example in contemporary times is the Gulf of Aden patrols. From 2008 onwards when piracy has infested the Gulf of Aden and North Aegean Sea, India has not joined hands with any NATO or any other construct,” said Sharma. 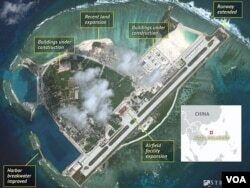 Wary of China’s push in South China Sea, where maritime and territorial disputes are festering, India has shed its traditional diffidence and been vocal in calling for freedom of navigation and maritime security in the disputed waters. At the same time, strategic experts say that New Delhi wants to be seen as a “neutral player” in an area where it is not directly involved. “India is worried that if we do joint patrols with the U.S, the Chinese could do it to us with Pakistan. That is really the worry -- the US navy can operate globally, but India is not that powerful and that same thing could be turned on its head as far as we are concerned,” says Joshi. Beijing’s bid to expand its presence in the Indian Ocean remains a huge concern for India and has partly prompted its growing defense partnership with Washington. Overriding Chinese objections, last year India invited Japan back into annual naval exercises held with the U.S. for the first time in eight years. This year, the three countries are scheduled to hold naval drills in waters off the northern Philippines near the South China Sea — a move that is likely to irk Beijing. 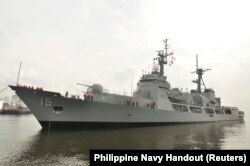 FILE - The U.S. Hamilton-class cutter, Manila's largest Navy warship, was sent to check on Chinese fishing boats after a Philippines Navy surveillance plane spotted the Chinese vessels in the Scarborough Shoal, April 8, 2012. But for the time being, joint exercises is as far as India is willing to go. “If India and the U.S. have not contemplated similar kind of patrol in Indian Ocean, what could justify India and U.S. patrolling waters of South China Sea?” asks Chintamani Mahapatra, a foreign policy professor at Jawaharlal Nehru University in New Delhi. India’s decades-long border dispute in the Himalayas with Beijing where their armies face off is also likely to hold New Delhi back from wading into the contentious waters of South China Sea. “We have a long border and it is just us and them on that border. We will certainly stand firm in our position, but we don’t want to provoke,” says Jayadeva Ranade, a China specialist at India’s National Security Advisory Board.